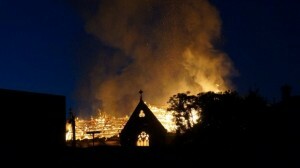 Some years ago we wrote an article on reducing your church’s risk of arson attack. This year (2016) an interfaith arson forum was run in Geelong by Ansvar Insurance in response to a spate of recent arson attacks on local places of worship. The forum was attended by representatives from about 80 faith organisations in Victoria, and outlined a number of tools and strategies for church fire safety and reducing the risk of arson, and for dealing with post-arson trauma. The forum was subsequently written up in the Geelong Indy, and also commented on by Crime Stoppers on our CCI Facebook page. In light of this we thought now might be a good time to reiterate the importance of reducing your church’s risk and to do an update on risk management strategies. Firstly, for a fire to take hold, three conditions are required – ignition, fuel, and oxygen. When one of these is absent fire will either fail to ignite or will peter out very quickly. Reducing your risk of fire from arson therefore involves changing the conditions by which fire can take hold, and conducting some other measures as well such as improving security. Examples of fuel sources that could enable fire to spread include debris, vegetation, rubbish, paper, rags, wood, boxes, gases, and flammable chemicals. Clean up rubbish from around the property; if a bin is kept on the grounds make sure it is fixed and lockable. Use welcome mats / door mats that are made from rubber rather than more flammable materials. Regularly clear out your roof’s gutters, and remove debris from around the property. If you have any chemicals or fuels on the property make sure they are locked away out of reach, such as in a secure shed. Out of hours, keep the premises secured / locked. Create a key-and-lock management system for your organisation – see our previous post on this topic. Consider a monitored intruder alarm system and / or CCTV cameras. Ensure you have good outside lighting and consider movement-activated lighting as well. See our post on the importance of good external lighting. Keep fences and gates in good repair, and keep gates locked after hours. Remove any bushes or shrubs that could be used as hiding spots by intruders. Remove items that could be used to gain entry – such as tools, bricks, and unsecured furniture. Before closing the premises make sure you have turned off heating and computers and extinguished candles. Report suspicious activity to the Police on 000 or Crime Stoppers on 1800 333 000, and engage with the police and with your neighbours. You might also want to consider a Neighbourhood Watch program. Develop comprehensive plans for fire safety and emergency evacuation. Provide fire safety training for key personnel in your organisation – see our training page for information. However only use fire equipment to contain small fires – otherwise leave it to the experts! Lastly if damage does occur from arson, contact Liz about making a claim, or get started with our forms.